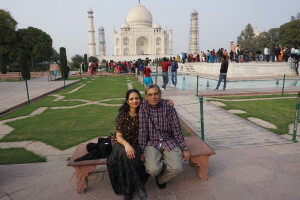 My wife Mina and I went to India for a 3 week vacation. This was my first trip back to India after 32 years of living in the United States; so the entire trip was like an event for me. It was made possible thanks to Garber Metrology and the company offered 15 years of service vacation package, with one week paid time off. We landed on Tuesday, and on Wednesday we traveled more than 650 kilometers to visit the Sai temple in Shirdi in Maharastra State. The next day, after an early morning prayer in the temple, we drove back to my home town, Baroda. We visited my home where I grew up, and visited family and friends. The following week we went to Delhi by night express train. The next morning we went to another temple located in Delhi. From there we went to Agra to see the Taj Mahal. It was fun to see the 561 foot high master piece. It is so beautiful. Then we came back to my home town, Baroda and visited some friends and family members. We did some shopping and returned. The trip was very good. We came home with lots of good memories. All friends and family members asked and even insisted that we visit them again next year. A special thanks to Garber Metrology’s CEO and owner, Jay Garber for providing a vacation opportunity to all employees who reach 15 years of service at Garber Metrology!